Originally from San Diego, Mr. Brady started off breaking in the mid 80's. Since the first time he heard hip hop, he's been hooked and started experimenting with rhymes around 1988. It wasn't until 1990-'91 that he started taking it seriously and began going to the lab to lay down tracls. He started off by using 4 tracks and between 1993-'94 he started putting out tapes and selling them in the streets independently. By 1994 he was featured on his first vinyl and was well accepted by the true hip hop world. By '96 he had a full LP out and 2 singles on vinyl. His music has led him to Vancouver where he met up with Swollen Members and was signed to Battle Axe Records in 1998-'99. Since that time he has been featured on many compilations and has released two albums with Battle Axe that were released worldwide. 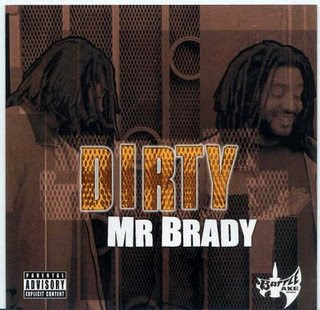 Features on Dirty include artists such as Swollen Members, Evidence, Moka Only, LMNO, OhNo, and more. Mr. Brady has toured many cities from the U.S. and all over Canada, opening for such acts as Slum Village, KRS-One, The Liks, Wu-Tang, and was also featured on the Vans Warped Tour. Now years later he has since met up with Johaz, Brea, & DJ Artistic to form the group Deep Rooted, in hopes of bringing about a soulful vibe for the whole world to feel.